Why Don't You Want to Talk About Money? Why Don’t You Want to Talk About Money? Growing up, we didn’t talk much about money. My parents talked about the importance of saving and of the importance of tithing, but we didn’t really talk about my parents’ financial situation, or talk much about what other people made. Talking about money — sharing the numbers — was taboo. It’s still fairly taboo to talk about money. Not too long ago, a survey came out that indicated that most Americans would rather talk about their weight than talk about their finances, and parents aren’t overly keen to address financial topics with their children. A recent study from Fidelity, addressing women and money, discovered that many women are “uncomfortable” talking about money. Indeed, many women are more comfortable discussing intimate details with their doctors than they are with the idea that they might have to talk about money with a financial planner. Worried that others will learn that we are doing something “wrong” with money. The idea that we should all be “equal” makes some people feel uncomfortable if their financial situation puts them in an “elite” financial category relative to their peers. Fidelity suggests that there is a confidence gap that makes men more likely to feel comfortable about their financial choices, and women’s lack of confidence might contribute to their reluctance to talk about money, even though many women already do a lot of things right when it comes to saving and investing. Another thought I had about why it’s more difficult to talk about money than to talk about medical issues is that we already have an instinctive trust for doctors. We know that they are professionals, and we are in a private, safe setting with a health care professional. Meeting with a financial planner seems different. We don’t view them as professionals in the same way, and there isn’t that same level of trust that we feel with doctors. 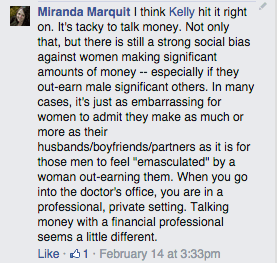 I’d be interested to see whether or not men also feel that same level of discomfort talking about money. We know that many men don’t want to talk about money, either, but are they uncomfortable to the same degree? My guess is probably not, just because of the socialization differences between men and women, but I could be wrong. As uncomfortable as it is to talk about money — whether you are male or female — it’s actually a good idea to talk about money. If you are in a relationship, honesty about money, and making decisions together, are important parts of building a strong foundation. You can’t work toward the same goals if you aren’t on the same page. Additionally, if one partner knows all about the money, but the other doesn’t have a clue, that can be problematic down the road if something happens. Talking with your children about money is also important. When you talk to your kids about money, you can help them learn valuable lessons, and get into the habit of examining their own money practices. It also helps to talk to financial professionals about your situation — even when you’ve done something wrong. Actually, it can be an especially good idea to talk to a financial professional if you are in a tough spot. A financial professional can provide an outside view of your money situation, and help you come up with a plan for overcoming your financial mistakes. Talking with a professional outsider can provide you with tools that you wouldn’t have on your own. 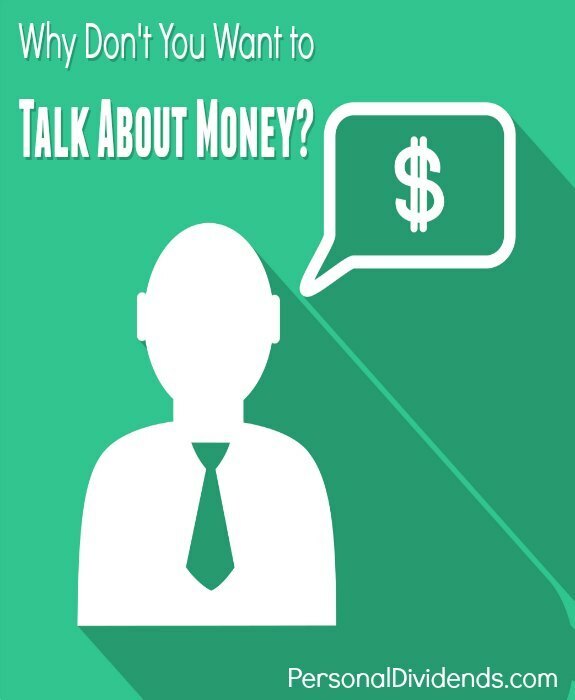 While you don’t have to talk about the minutiae of your situation with strangers, or tell your kids all your deep, dark money secrets, it still makes sense to talk about money to some degree. Avoiding the subject altogether is likely to do more harm than good, and it could keep you in deep financial trouble for years to come. I’ve found that talking about money with friends and people I know to be a touchy subject. Everyone values different things and most people don’t want to be told to spend their money differently. They want to justify their purchases as a good decision, even if you were just trying to offer advice. I do think it’s extremely imporant to talk about money with your significant other though! Same thing goes with introducing kids to money and being honest about things. Your point about talking about purchases is important. We need to remember that what matters to us might not matter to others. I used to be really judgmental about how other people used their money. But then I realized that, if they could afford it, and it made them happy, who cares? They probably think I use my discretionary money for stupid things. I guess women, in most cases, are very conscious. I’ve never really met one and spoken to me about their finances.